I don't know much about public transport (bit of an admission that, for a time served coach builder), but I like some of these old trams. 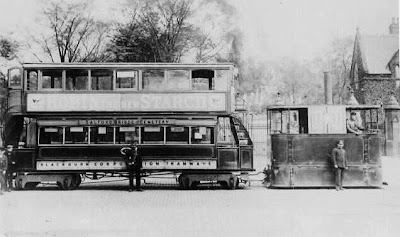 Here's the Salford Bridge-Cemetery steam tram, parked up outside the cemetery gates. I'll bet they were a sight to see, trundling by, puffing steam out of the engine. Bet they made a bit of a racket too. The second photo, I have only added to accompany the top image. It says Blackburn & Over Darwen on the side of the trailer car and by the look of the hilly backdrop, it looks like the photo may have been taken in Darwen. I'm not certain John, but the line to Wilpshire was electrified in 1901, so it will pre-date that. The line was also extended in that year too, as until then, the trams terminated here, outside the cemetery gates. Info courtesy of Jim Halsall. An update John. The Cemetery route was only opened in January 1888, so the photo dates between 1888 and 1901. 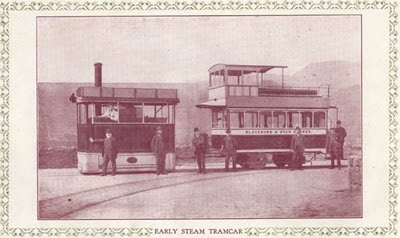 To narrow down the dates a little more, the Corporation took over the Blackburn with Over darwen company from January 1st, 1899 and the electrified trams took over on July 4th, 1901. Thanks Colin terrific photos this question may sound dumb but did the steam engine run in the tram lines or did it steer, the reason for the question is that the wheels of the engine are not visible and it would not need turntables or shunting lines with points if it steered on own. Colin have answered my own question they ran in the same rails as the tram have looked at other photos on Google and the engines shown there dont have such low skirts so the wheels are visible also one shot shows the engine without the tram and its clearly in the rails. Should have checked before I asked but then again the whole idea is to promote interest so maybe all questions are good even if dumb! !